For those of us that live in the Northeast the weather has been snowy and cold this March. Normally as a golf fan I can get away from the drab cold days of winter by watching golf and day dreaming about the coming summer golf season. This year even watching golf to escape the cold is not guaranteed. Golf Analyst Mark Rulfing mentions in the video that it reminded him of Kapalua. He was referencing the first tournament of the 2013 season, the Hyundai tournament of Champions, which was delay due to high winds (gusting 40 to 50 mph). The Golf Channel has a great photo slide show of the windy tournament. Another tournament impacted was the Farmers Open at Torrey Pines which was delayed due to Fog. So rain, wind, fog all seem like expected reasons for golf to be delayed but how about snow? Yup, the WGC Match Play in Arizona was delayed this year due to snow. Snow in Arizona. It was so bizarre that all the players were tweeting photos of it. Bubba Watson even posted a 30 second video of his snowball fight. Maybe I should be happy for the weather delay today because my fantasy pick for the Hyundai, tournament, Dustin Johnson, won. So, if I were at all superstitious I would be thinking the weather delay is “a sign” that Tiger should win tomorrow. Still I would rather have the final round played on Sunday so I could watch it live. This week the PGA goes to Texas for the Velero Texas Open and the most written and talked about moment, prior to the tournament, is not about last year’s winner but about Kevin Na’s score on the par-4, 9th hole — the score was 16! If you like to see “melt downs” watch the video. So what will Kevin Na shoot on the 9th hole this week in Texas? My guess is he will be happy with par but hoping to birdie the hole to show everyone that the 9th hole is not going to be his nemesis. Na has a great sense of humor about it. 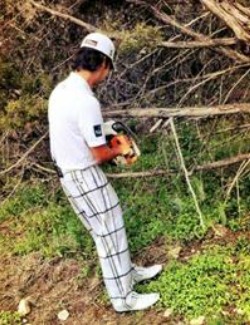 He went back to the place of his melt down this week and took a chainsaw to the overgrowth (photo from PGA tour). Now that is one way to destroy your demons on the golf course. And, now for a disclaimer — stunt by a professional golfer, do not try this on your home course.